Robert Holley was a US biochemist who shared, with Har Khorana and Marshall Nirenberg, the 1968 Nobel Prize in Physiology or Medicine for his work on the way genes determine the function of cells. 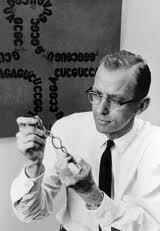 Holley described the first full sequence of sub-units in nucleic acid, the genetic material of a cell. This was an important step toward the understanding of gene action.